Nestled in the town of Stowe at the base of Vermont's highest peak, Mt. Mansfield, this is a great getaway for any one who needs a breath of fresh mountain air. This resort offers beautiful lodging, a full-service, 50,000-square-foot spa with salon, a fully equipped sports club and fitness classes, two restaurants, and healthy Spa Harvest Cuisine - all with breathtaking Green Mountain views. Surrounded by the scenic splendor of Stowe, the new, luxurious Spa at Stoweflake celebrates Vermont's natural abundance with local herbs and natural essences as the basis for many of the spa's exclusive aromatic and rejuvenating treatments. Stoweflake Spa embraces the true origins of the spa experience in incorporating 'Solacium Per Aqua' (comfort and wellbeing through water), as a pre-treatment ritual every spa guest can enjoy. Before a service you can enjoy the 'taking of the waters' circuit, entailing a soothing hydrotherapy waterfall inspired after Stowe's Bingham Falls, a Hungarian mineral soaking pool, hot tubs, and Eucalyptus-infused steam rooms. One then relaxes in a private fireplace lounge listening to the sound of water from the spirit falls water sculpture before being introduced to one's therapist. One of the spa's signature treatments gets its inspiration from a local swimming waterfall. The Bingham Falls Renewal with Seasonal Sensations inspires you to stay healthy throughout the four seasons. This invigorating experience features a seasonal specialty body scrub with an optional warm Vichy rainwater rinse, topped off with an aromatherapy oil massage. Your seasonal themes include a Winter Wellness Immune Builder, Spring Renewal Body Purification, Summer Refresher Skin Hydration, and Autumn Balancing Exfoliating Nourishment. Personal renewal is ready for the taking with fitness evaluations, indoor/outdoor fitness classes, life enhancement consultations, wellness and nutrition courses, and walking mediation though a seven-circuit labyrinth. The six-room fitness center includes a large Cybex weight and cardio room, a private women's workout center, a fitness class studio, a Schwinn spin studio, a private stretching and movement room, and a racquetball/squash court. Even the most serious fitness enthusiast could not get tired of working out at Stoweflake. With up to 70 classes a week, you are sure to find the perfect fit for any type of activity level. The class offerings include Stott Pilates, Ashtanga and Ivangar yoga, spinning, kick boxing, Nordic walking, guided snowshoe treks, hikes, and bike tours. Once you have worked out on your own or tried one of the energizing classes, it is time to head to the spa's private sanctuaries to choose from a menu filled with more than 120 unique and rejuvenating treatments. Accommodations range from carefully appointed luxury rooms to Meadow townhouses overlooking the magnificent Green Mountains or meditative gardens. 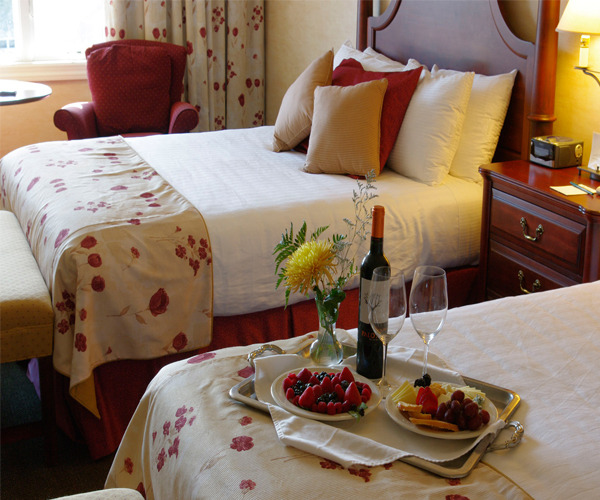 More than eighty of the rooms feature fireplaces, and guests may choose from standard, deluxe, or luxury resort rooms. They may also select a suite, which has a living room, a bedroom with a king-sized bed, and a bathroom with an oversized Jacuzzi tub, plus a balcony and a fireplace. Stoweflake also offers townhouses in a secluded setting with beautiful mountain views and a door side 9-hole, executive par-three golf course. Meals that balance nutritional concerns and pleasure are central to the spa's mission. Fresh seasonal ingredients inspire Executive Chef Jeffrey Weiss's innovative Spa Harvest Cuisine, which uses many ingredients that are picked just steps away. Guests are meant to savor the culinary experience at Stoweflake, whether they are dining at the award-winning Winfield's Bistro or the more casual Charlie B's and Spa Pool Side Café.